Former Philadelphia Mayor Michael Nutter discusses his new book about the trials and triumphs of being a big city CEO. There’s an old saying that all politics is local, and few know that better than Michael Nutter. He served almost 15 years on the Philadelphia City Council before being elected as the city’s mayor, a position he held for two terms. Nutter, a Democrat, left public office in 2016 and now serves as an executive fellow at Penn’s School of Social Policy and Practice and professor at Columbia University. 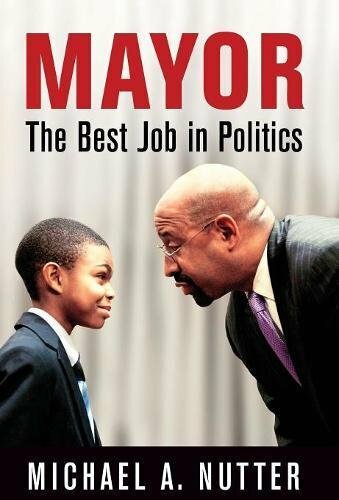 He’s also written a book about his tenure leading America’s sixth-largest city, titled Mayor: The Best Job in Politics. He talked about his book on the Knowledge@Wharton radio show on Wharton Business Radio, which airs on SiriusXM. Knowledge@Wharton: Why do you believe mayor is the best job in politics? Michael Nutter: You can get things done, make things happen. It’s the day-to-day activities, whether it’s making sure that folks’ trash gets picked up, there’s water when they turn the faucet on, a professional police officer or firefighter shows up if you’re in distress and you call 911. You can help create an environment for jobs and economic vitality, look after our schoolchildren — and it’s a lot of fun. It’s a serious job, it’s a real job. You’re dealing with real people who have real challenges, but it’s very rewarding, and that’s why I say it’s the best job in politics. Knowledge@Wharton: I would think you’d need to have thick skin. Nutter: Sure. Whether it’s Philadelphia or any of our great cities, often it’s a full-contact sport. You can’t take it personally, but people have a right to express themselves and you have a responsibility as an elected official to at least pay attention and address the serious issues that people raise. In many instances, people only know you from TV or listen to you on radio or read something in print. They don’t know necessarily what’s in your heart and soul, but they’re crying out for something or they’re upset about something. Often in this job, you do things that upset people. Knowledge@Wharton: What made you want to pursue public office? Nutter: It all started at a night club. I came to Penn in 1975 with my best friend from high school, Robert Bynum. He’s gone on to become a great restaurateur and club owner. But his father opened a club in North Philadelphia in 1976, and we started working there when we were 19. From there, I met a lot of people who were in politics or trying to get into politics, or who were already elected officials. The black community was increasingly active in the political environment here in Philadelphia. I started talking to some of those folks and started working on a campaign volunteering, and it went from there. Knowledge@Wharton: In any city, you have areas where the needs are vastly different than in other areas. That’s a challenge. Nutter: I certainly experienced that when I was a city councilperson representing the 4th District. That’s north of Penn, neighborhoods like Wynnefield, Overbrook, Roxborough, Manayunk, East Falls and a small part of North Philadelphia. It includes four public housing developments and homes that are more than $500,000. Many of the issues and concerns of the residents of the same council district were vastly different, depending on the neighborhood. Multiply that by 10 when you look at the entire city. This is a great city. Diversity is our strength, but we have some challenges along with many of the positive things going on. Knowledge@Wharton: It’s easier to lead in times of celebration, but it’s tougher when tragedy strikes. How do you comfort a city when firefighters or police officers lose their lives in the line of duty? Nutter: We’ve had our share of those tragedies. I lost eight police officers in the line of duty, four firefighters, a young utility worker who was killed in an explosion, and one of our fleet management personnel was on a ladder when it failed. He hit his head and died. Those tragedies, those incidents, they stick with you. They never leave your soul. But in that moment, it’s not about you. It really is about that family. It’s about comfort. It’s about support. It’s about encouraging the rest of the workforce and to watch very brave men and women. Your role in that moment is to provide as much comfort and support for their family and for that larger, extended family of officers. And there’s no training for that. It’s a rollercoaster-of-emotion kind of a job. I could have been reading to second-graders at 8:30 a.m. and then have to go deliver remarks at someone’s funeral later on that day. Knowledge@Wharton: As mayor, you had to work with the business community. How did you view that part of the job? Nutter: First and foremost, you have to think about mayor as being a CEO. I’d have a conversation with business executives that [the city] is a very large customer-service company with $7.8 billion in revenue, 28,000 employees and 1.5 million shareholders. We have a variety of lines of business: public safety, fun and entertainment with parks and recreation, business development with the commerce department. Our job is to create an environment where businesses can grow and flourish. If you put Philadelphia as a company on the Fortune 500, we’d be about the 360th largest company in the United States of America. There’s a business case to be made for how the city engages with the business community. What do business people want? They want security. They want to know what the rules are, how you play by those rules and that there’s a relatively normal environment. Obviously, folks want to pay the least amount of taxes possible and have high-quality services. Well, that’s the way you also run a business — high-quality service, low cost, and you expand your market share. There may be some controversies from time to time. I think the mayor’s job is to make sure that you’re actively promoting and marketing the city, that you can represent us to the region, to the state, to the country and the world as a place where we have high-quality talent, great colleges and universities, tons of really smart young people and an environment that is stable, where you could feel comfortable placing your business. Knowledge@Wharton: How do you balance business growth with the needs of the community? Nutter: There’s always a balance in that you want great growth by companies, you want them to bring more people here. But your job as mayor is primarily focused on your citizenry and how they are doing. Are there job opportunities for people who live here, who have made this city the great place that it is? How are we doing on workforce development and skills-building? There is still a pretty big gap between the jobs that are currently available and many people who do want to work but don’t have the skills to take those particular jobs. We have to constantly focus on skills-building and development and making sure that we’re matching people up with jobs for the future, not jobs that are going away. Knowledge@Wharton: That also means that you need to build up education as much as you can. Nutter: Whether by law or not, the mayor is directly or indirectly in charge of education. I always took the position that these are my children, this is our city, and the true aspect of growing and developing a great town, in addition to making sure that people are safe, is that young people and adults are getting a high-quality education. That means a stable funding stream, high-quality and supported teachers in a classroom, an administration that is focused on the development of the whole child and then matching that system up with the great colleges, universities and technical schools. Knowledge@Wharton: How did you view the balance of dealing with the public education system but also the charter system here in Philadelphia, which in your time saw significant growth? Nutter: Part of this is about mindset and language. I always started with the premise that charter schools are public schools. Many years ago, they used to have a separate funding stream. A previous administration cut that funding. At the same time, I was in the position of having to raise people’s taxes to support those efforts. Charter schools provide a different educational opportunity for parents and their children to stay in the city of Philadelphia. Parents should have as many high-quality options as possible. We have a great district-managed system. We have a charter school system. We have private schools, religious schools. Philadelphia is big enough to accommodate all of them, and I think that contributes to the diversity of our population as well as the educational opportunities for kids. Knowledge@Wharton: When you were mayor, did you see the push by millennials coming into neighborhoods that saw unbelievable growth, both in numbers of people and property values? Nutter: Absolutely. When you go back and look at the stats, that growth started somewhere in 2006, 2007 and then really took off. Many of our policies were geared toward encouraging more and more of that growth. We tried to make Philadelphia a more immigrant-friendly city. Our focus on sustainability, bike share, bike lanes, greening Philadelphia, making Philly more fun, and raising our profile nationally and internationally was part of a larger plan to attract and keep the millennial population. What we saw, at least during my time, was the largest percentage increase in millennial population growth of any major city in the United States of America. Knowledge@Wharton: How did you deal with the recession? Nutter: I tell the story that I got elected in November of 2007, sworn in January of 2008. No one mentioned, because we didn’t know, that the Great Recession had started in December 2007 and wasn’t full blown until the fall of 2008. How did I deal with the recession? Well, the recession kind of dealt with us, nationally and internationally. Our focus was that we had to maintain core services for the city, that we were not going to have massive layoffs, that we were going to get through it by shrinking the size of government and then be ready for the recovery, whenever that was going to take place. That was what we called a shared sacrifice. We cut services and raised taxes, not a political strategy I encourage others to pursue. But you do what you have to do. I think it ultimately made the city stronger and ready. We were one of the few cities coming out of the recession to actually get a bond rating upgrade. Knowledge@Wharton: What do you see as the path ahead for Philadelphia? Knowledge@Wharton: Meeting those goals takes a great team, correct? Nutter: You can’t manage and monitor every person in the government, but I think part of the key there is to hire the best, most qualified people that you can, make sure that they understand what “team” means. We see this all the time, that there will be some superstar person. They come in tremendously good at their job but also really disruptive to the entire organization. What I try to do in picking the folks to be in the administration is not only think about their skill set but also their ability to work with other people, that being part of a team really does matter. I think we had some of the best public servants, top to bottom, of any administration in modern times. I don’t care who you are, you’re not getting all this work done by yourself. You get a lot of accolades, you get a lot of complaints, whatever the case may be — that goes with the job. But the real day-to-day work is the people. Folks ask me all the time if I miss being mayor. I loved it during my time. But you fall in love with the work, not the job. What I miss the most is the people who I used to work with. I knew my time had a limit. You have to go. But staying in touch with them and talking with them and seeing what’s going on with their careers is really what I miss the most. Knowledge@Wharton: Is your political career on the shelf? Nutter: Yeah. I won’t be running for office. At 60 now, I still think I’m relatively young, although my daughter tells me I’m old. I think my role now is to help other candidates. [It] really is time for a generational shift in the city, in the state and in the U.S.; the 20-, 30-, 40-somethings should be running for office now. I think we need a pretty significant wholesale change. That’s partially how we ended up in the situation we did in Washington, D.C. I’m really more adviser, supporter. But because I’ve had the best job, there’s no other job I’m interested in. Knowledge@Wharton: Do you think citizens in general feel good about political leadership at the city, state or federal levels right now? Nutter: I think folks are fine here and feel good about what’s happening in Philadelphia. There’s a tremendous amount of distress, though, at the national level. Every half-hour, every half-day, every other day, there’s something seemingly weird, unusual, bizarre or just upsetting. And I think 2018 will be a bellwether year. Folks have to figure out that they have to go to the polls and actually vote and pay attention to what’s going on. We’re seeing the result of what happens in elections.